Other ways customers are using Happy Campers to eliminate Odors! After almost 10 years of marketing our products we have had a number of customers telling us of other uses they have found for Happy Campers. We decided to share some of them with you. “Between me and my 2 daughters we have 9 dogs at 3 homes. Anybody that has dogs knows that they can have mistakes on the carpet. If using a carpet cleaner machine, use no more than 1 scoop (1oz) to a gallon of water. Go over carpet with mixture, then again with plain water. If spot spraying, mix as strong as 1oz in a 16oz spray bottle for real tough jobs. Spray wet, let sit for 2-3 minutes and wipe well with a damp cloth towel. You can use Happy Campers on your pets (just don’t get it in their eyes) It will not harm your plants either. Best to use a spray for your plants. We have received letter from a number of cat owners that have told us they sprinkle it on the surface of their litter boxes and it eliminates all the odor and does not bother the cats. They use 1-2 scoops depending on the size of the litter box. They have also been able to extend the use of the litter by adding some if needed. Note: do not mix into the litter, the cat will do that. Deb from Arizona said her dog has been sprayed 3 times and that Happy Campers works the very best to get rid of the odor. 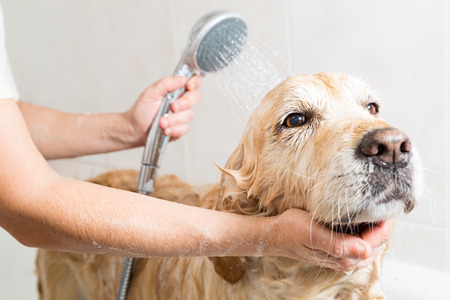 First wash the pet with Blue Dawn dish soap to break down the oily part of the spray. Then mix 1oz Happy Campers with a gallon of warm water and wash the dog, just try to keep it out of the pets eyes. Rinse and dry with towel. No more odor on pet. You may need to spray or sprinkle the area where the skunk sprayed. A gentleman from Arizona puts a scoop in his washing machine and also the dishwasher about twice a year. He says it removes the scum and leaves a nice fresh smell. Renters moved out and left food in the refrigerator for weeks before the owner found out. He put 1/2 scoop in a spray bottle, gave it a heavy spray job and left it for a few days. When he came back and opened it, no smell at all. Can’t get a bad smell out of your clothes? Add a scoop of Happy Campers without soap. You will like the results. Hunters use it so there is no soap or other odor in their hunting outfits. If you know of any good uses for Happy Campers like these, we would love to hear from you.